Founded in November 2016, Medina Bike already boasts 5,000 users and a partnership with the Moroccan government. Bike share programs aren’t just intended to provide an active mode of transportation for moderate distances; they’re also meant to cut down on car usage, thereby reducing carbon emissions and helping to stave off global warming. Just in time for the COP22 climate conference, the medieval Moroccan city of Marrakech recently debuted a robust bike-sharing scheme that makes 300 bicycles distributed across 10 ren- tal kiosks available for 24/7 public use. With 320 brand new bicycles docked in 10 key landmarks and available 24/7, the environmental friendly project also taps into an old cycling tradition in the city. You can take a Medina Bike in one of our station all around the city. Be careful Ferblantiers station (6) and the railway station ( gare ) are unavailable at the moment. Check out our Bike map for updates. For information you can meet us at our shop at the COP22 station ( green zone entrance) from 9.30 to 6 pm. Every day our MEDINA BIKE ambassadors welcome you at our stations ! Earlier this week, as the United Nations COP22 climate change conference commenced in Marrakech, the Moroccan Minister of the Environment Hakima El-Haiti took a spin on a new bike. And this wasn’t just any bike: El-Haiti rode a “Medina Bike” from the country’s new bike share—the African continent’s first. 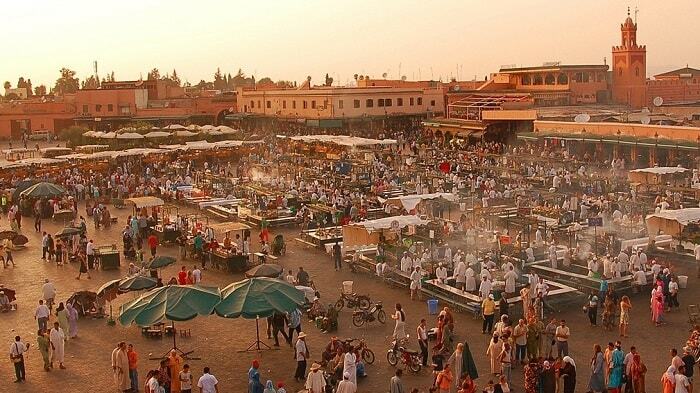 Marrakesh launch its first bike sharing system ! The city of Marrakech launch its first bike sharing system during the COP 22 ! Come discover and try the MEDINA BIKE system !